Time: Hot Creek generally 6:00pm to 8:30pm or thereabouts. # of fish caught: don’t know. Size of fish caught: Landed a 16 inch fish at Hot Creek. Other Hot Creek fish were 12 to 14 inches on average. Bernard's Creek 6 to 8 inches average. None at Rock Creek Lake, 15 inches at Nosy Lake. 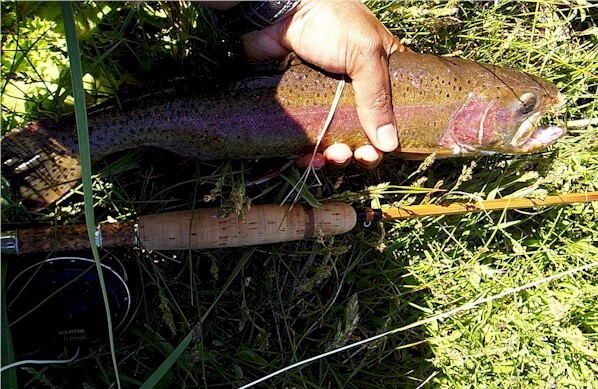 Method: 7.5ft 5x leader in lakes, 5x at Hot Creek. Short Line Nymphing without an indicator on Hot Creek. Set Up: Medium Action Cane 8ft 4wt rod made by me. Each trip there’s one memory that stands out more than any other. This trip it would be of the fish that was lost. After almost a week at Mammoth Lakes with my wife Vita and very little fishing, I found myself on Hot Creek one evening with my friend Roger. It was late, most of the fly fishers had left for the evening and Roger and I were fishing the middle section of the Hot Creek canyon. Perhaps I should say I was fishing. Roger was all suited up, with gear in hand but instead of fishing he decided to watch the comedy act that was my assault on Hot Creek this night. We started by hitting my favorite big fish pocket, which didn’t yield a big fish but did give up a rainbow or two. I narrated as I fished, showing Roger the spots I like to fish at this time of year and how and why I like to fish it. After the big fish run we headed to where the small bluff divides the creek. We moved upstream and I hit the pockets as best I could. Most of the time the low light made it difficult to watch my line but I still managed to catch a fish here and there, spending a little bit more time at each run than I might normally do to compensate for my less than skillful fishing this day. I’d been fishing a small run that usually gives up a nice medium sized fish and had probably lost a fly or something. Maybe I was just watching the water, looking for fish, I don’t remember but I looked down at small pocket next to the near bank and saw a huge black shadow. Was it a rock? Maybe, lots of fish I thought I spotted that day turned out to be rocks. I had just finished telling Roger that once all the fisherman leave, the fish return to active feeding along the near bank. During the day, these fish are either ignored or pushed off the bank or put down by folks walking the waters edge, but at night, after everyone has left, one can fish within 1 foot of the near bank and pick up fish. The night before I’d done just that and picked up a fish every 6 casts or so, this night, the water was more off color and the fish didn’t seem as active as the night before. Regardless, I watched the black shadow. It moved and revealed a huge fish actively feeding below a rock. At one point, it came close enough to the surface that I could see a tail that looked to be 6 inches wide. I was wonderstruck and called Roger over. The fish wouldn’t move and Roger couldn’t see him. It was like a Bigfoot sighting. Roger couldn’t corroborate the fact that I was fishing over a monster. I fished for what seemed like 30 or more minutes. I was close to giving up when, with a small break in the wind, I was able to see that my line had paused. “I think I got him!? !” I called to Roger and set the hook. It was the fish of a lifetime. Big and powerful, so powerful that it slowly sauntered downstream. I pulled back on the fish strongly but couldn’t budge him. He swam downstream and fearful that he’d ended up in the fast water, I pulled him toward shore. The fish paused and then headed upstream. Roger had his net in hand and I thought I might be able to steer him into the net as we’d done with several other fish that night. This fish was too powerful for that and despite my efforts, simply swam underneath me and under the bank. He became entangled in the weeds. I gave a little slack and then pulled back on my rod. He was still on. I decided the only thing I could do was horse him out from under the bank and then it happened. My line snapped and I lost the fish. The fish was so powerful that at no time during our fight did I bring it close enough to the surface for Roger or me to see clearly. “Did you see it?” I asked Roger. Nope. Bigfoot to be sure or perhaps the "Hot Creek Monster. " I caught a few more fish that night but when I missed the strike of another big fish, I broke out into a voodoo dance of frustration… like I said, it was a comedy. Early that day, Roger and I fished a place I have called on this site “Bernard’s Creek.” (Sorry Les. :) ) Bernard’s creek is a small meadow stream with large fish that used to be hidden in plan sight but now seems to see a fairly good stream of fishermen. Roger and I fished the stream for several hours, picking up a few fish on nymphs and dries but not seeing any of the 16 inches plus fish that I’d hope to see. In the afternoon we decided to fish Rock Creek Lake which was still partially covered with ice. It was a fairly easy hike around the lake to the inlet. A small portion of the far trail was still covered with 3 or so feet of snow. There was enough snow to completely bury one of my legs when I stepped on a soft spot but not enough to deter us in our quest for the inlet. I fished the inlet stream while Roger fished the lake. Both of us came away smelling of skunk and so we had set off to Hot Creek. I’d already fished Hot Creek twice that week. On Monday night I fished the upper public portion for an hour or two. It was my third outing this year and my third in over 6 months. I’d initially thought of nymphing. That would almost guarantee me fish on this stream but as I approached the stream I decided I wasn’t in the mood for numbers. I was in the mood for a challenge. Spring Creeks are slow and clear enough that they should be sight fished just as I do on mountain lakes and so, I crawled my way to the stream's edge and sat and stared at the likely holding spots. I sat quietly and when I thought I’d found a nice fish of, I'd make the cast. Unfortunately, there was no hatch this evening and no fish actively working. I caught one fish with a blind cast to a small midstream gravel bar but that was it. Two nights later I returned for the numbers of large fish a well placed nymph would grant. It was Wednesday evening and as I pulled into the parking lot I was taken aback by the number of parked cars lot and later disappointed by the number of anglers actually on the stream. I started at the mid portion of the mid section of the stream and I was off my game. The usual lies didn’t produce the fish I hoped they would but I still caught fish and when a young women ran to my side, just after I released a 16 inch rainbow back into the water. The stream rewarded her for her enthusiasm by allowing me to catch a 14 inch rainbow on the second cast with her by my side. My reward, the great picture she took of the me on Hot Creek. We chatted a little and then she and all the other anglers left for the evening. With an additional 45 minutes or so of light left, I decided to head downstream a bit to check things out. I haven’t caught a fish from the big riffle in years; my current fishing techniques don’t work well there so I decided to do something that I hadn’t seen done or done myself since the days when Mike and Marlo and I used to fish the stream. I worked my way up the bank, throwing a curve cast so that my fly would drift back to me as close to under the bank as I could get it. The wind had lessened a bit and more of my casts landed in the water than landed in the nettles and the fish came readily- not monsters, but not dinks either. Roger and I met the following day and then again on Friday. Friday our plan was to fish the Sawmill/Tioga area. With any luck we’d find Tioga Lake iced out and/or be able to hike to one of the near by lakes. Unfortunately, Friday morning on Tioga pass was characterized by bright snow, grey sky, high water and cold air. We headed south and almost as an afterthought ended up at “Nosy” lake. Not it’s real name and not really a secret but whenever a piece of water is brought to my attention by a person rather than a book, I tend to keep it’s identity under wraps. I first read about this lake in Barbier’s book but it was my friend Bernard that peaked my interest in the lake several years ago. Despite this, I’d never gone and knowing that Roger was familiar with the lake, I wondered if he thought it would be ice free. He did and so we took a short detour to a nearby trailhead. The hike was short but it was already mid day and we meet several fishermen, fly and other, heading back to the trailhead as we made our way up. Each warned us off the lake and instead suggested we fish the creek. The lake, they said, was too windy. The lake was windy but Roger and I gave it a go anyway. After some slight bushwhacking and surveying about half the lake, we found a promising spot and went to work. It didn’t take long for the lake to reward us with a 15 inches and 16.5 inches Brown Trout for myself and Roger respectively. My fish came on the second cast and Roger’s very shortly after that. I remarked that catching the fish so quickly was a bad omen and so it was. We wouldn’t catch another fish from the lake the rest of the afternoon. On the hike back to the cars, the outlet stream gave up one foul hooked 12 inch brook trout but took about a half dozen flies in return. The following day Vita and I headed home. Tioga Pass is open, the Tuolumne River is full and Tuolumne Meadows is a field of snow. It’s going to be a late and long high country season.